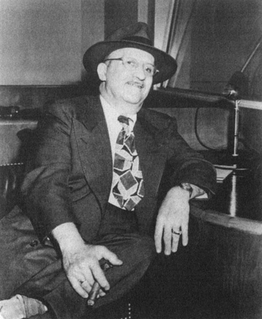 Savoy Records is an American record company and label established by Herman Lubinsky in 1942 in Newark, New Jersey. Savoy specialized in jazz, rhythm and blues, and gospel music. In September 1956, Herman Lubinsky announced the signing of a new group of teenagers from the Brooklyn, The Cubs. The group consists of Lee Witherspoon, Beni Israel, David Makonnen and Tafari Makonnen recorded four song in New York; "Why Did You Make Me Cry", "I Hear Wedding Bells", "What Is The Proper Age" and "Do You Know". The first two titles will be released on Savoy # 1502. "I Hear Wedding Bells" by The group is a Masterpiece with a spoken bridge that combines diffidence and sincerity Quite a Trick. 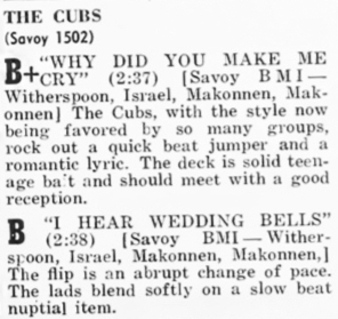 The Cubs have the classic kiddie lead voice ala the Schoolboys, Frankie Lymon & the Teenagers.